Sheppard and his team attempt to locate Lieutenant Ford, only to find themselves captives of a former soldier who is being hunted by the Wraith. Atlantis officers patrolling P3M-736 report finding a dead Wraith. The enzyme sack in the right arm has been removed. Sheppard immediately suspects Ford and orders a mission to investigate. Before departure Colonel Caldwell reminds Sheppard that Ford is a security threat. If the opportunity arises the Colonel should deal with him. It is nightfall when the Jumper arrives. The lifesigns detector is not functional. Sheppard separates the team in a search pattern. Soon he and Teyla find the location where the Wraith was slain. She locates where the brush has recently been disturbed and they follow the path in that direction. Major Lorne and McKay begin to pursue a suspect at about the same time Sheppard and Teyla are in pursuit of one of their own. Teyla is stunned to the ground, and Sheppard is soon taken down as well. When they wake, they are bound together at the mouth of a cave. A large, powerful man has captured them. Sheppard’s weapon pointed in their faces, he shares his name and rank. “Specialist Ronon Dex,” replies the man. In the morning Lorne and McKay continue their search for Ford. Fifteen minutes into the patrol Lorne is stunned by a Wraith pistol wielded by Ford, who takes Rodney with him so they can “catch up” while on their way to save Sheppard and Teyla from Ronon. Ford had been scouting a planet where a Wraith hive ship had landed. Seeing a Wraith commander detach from the main group, he chose to follow the creature through the Stargate. This led him to 736. The commander was hunting Ronon, but Ford killed him for his enzyme. 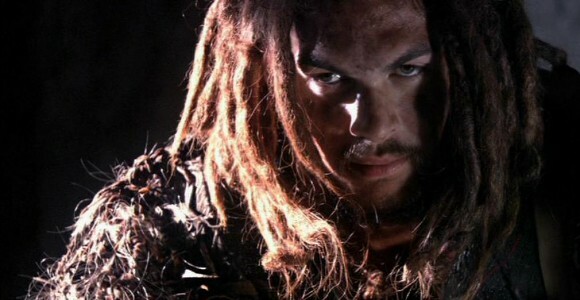 Still holding the pistol at his captives, Ronon explains that the Wraith hunt him for game. He can’t stay in one place for too long because they have installed a tracking transmitter in his back. Sheppard insists that Dr. Beckett would have a good chance of removing the transmitter. Eventually Ronon agrees to trade the surgery for recapturing Ford himself. Sheppard returns from Atlantis with Dr. Beckett who locates the transmitter in his back. He insists Ronon lie down and take a sedative to sleep, since he will be cutting very close to his spinal chord, but Ronon insists to do the procedure sitting and awake. He manages to remove it, and shortly afterward Ronon falls unconscious. Ford passes McKay a gun and goes hunting for Lorne and another SF who has come in pursuit. When the men find McKay, Ford stuns them from behind. Rodney insists he has had enough and is going to take Aiden back to the Jumper, but Ford doesn’t believe he’ll hurt him. McKay shots him in his left shoulder. Seeing the look on Ford’s face, he runs in the opposite direction. Beckett has deactivated the transmitter just as they hear McKay firing his weapon, screaming for help. The Stargate is activated and three Wraith Darts emerge. McKay is caught in one of Ronon’s traps and hoisted into a tree. When Ford catches up he is fully prepared to execute the doctor, but Ronon arrives and turns the tide. A knife fight ensues, but Sheppard arrives to stop it. Ford turns and flees. Sheppard chases him to the culling beam. Realizing there is no other way off the planet, Ford swears that he’ll show them all that he’s OK — better than OK — and runs headlong into the beam. Sheppard takes Dex back to Atlantis, and when he has news brings him to the control room. They have sent a M.A.L.P. to his homeworld, Sateda, but it does not appear that anyone survived the last attack. Ronon no longer has a home to which he can return. “This story is all about, yes, you guessed it, running. It also marks the debut of our new character, played by Jason Momoa. He’s got a tracking device in his back that allows the Wraith to know where he is at all times, so he’s constantly on the move. … Jason is 6-foot-4 and has this deep, booming voice, but he’s not Chris Judge junior. He’s a terrific addition to the Atlantis team and is willing to do anything you ask of him. “In ‘Runner,’ Jason had to run a lot. He’s got bad knees but he said to me, ‘Its OK, I can do this.’ One of the days we were in the woods doing a scene and I said to Jason, ‘You have to run towards us, take a shot in the leg, and then Ford challenges you. He eventually leaves and you get up and tear out of there.’ I figured Jason would just run out of the shot, but he decided that he would stay in the frame and we’d follow beside him. We had our steadi-cam mounted on tracks, I yelled, ‘Action,’ and we began shooting. At the end of the scene, Jason ran off through the dense bush and we couldn’t keep up with him. He was too fast for us. “Intermingled with [Ronon Dex’s] story is the return of Ford, or should I say ‘Super’ Ford. At the end of ‘[The] Siege,’ the lieutenant winds up with certain abilities he didn’t have before. This year, Ford is a new character in that he’s no longer young Aiden Ford, with the boyish charm. He not only has an edge to him, but he’s nuts, too. It’s hard when you’re dealing with nuts and even harder when you’re dealing with super nuts. “It was very hard to let go of Rainbow. However, he’s doing an amazing job in his recurring role as the ‘new’ Ford. VOTE! How would you rate Atlantis's "Runner?"